Each night at 8:30 PM, the residents of East Providence, Rhode Island take a moment to let the children at Hasbro Children's Hospital know they are thinking of them. People gather along the Providence River shoreline to flash lights in the direction of the hospital. Many residents of apartment buildings facing the hospital flicker their lights, too. On Mondays and Wednesdays, the Providence and East Providence police departments, respectively, participate by lining up available cruisers in view of the hospital and turning on their emergency lights. 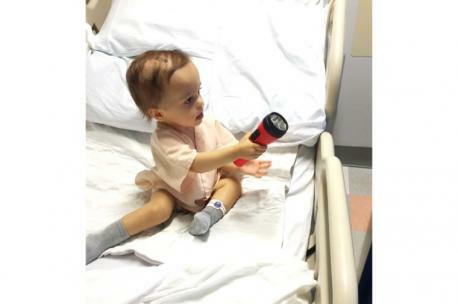 Many businesses participate by donating flashlights that the children in the hospital use to signal "Good night" back. Some businesses have installed large beacons on their buildings just for this initiative. 1. The tradition was started by Steve Brosnihan, resident cartoonist with Hasbro Children's Hospital. He had bonded with a teenager who had been in the hospital for a very long time. On the boy's last night there, Brosnihan wanted to do something different for their final farewell. Brosnihan told the boy to watch the corner near the bus stop from his window. He then biked to that spot, turned around, and flickered his bike light up toward the hospital. To his surprise, the teen flickered his own room lights in response. "From a quarter mile away it was very evident where the kid was," says Brosnihan. "I figured if it worked once I could do it again." Were you familiar with the Good Night Lights of Providence prior to this survey? 2. Earlier this year, NASA astronaut Anne McClain sent a special greeting to Hasbro Children's Hospital from the International Space Station. Patients were shown the NASA video in the playroom on the fifth floor just before Good Night Lights was set to take place. The tradition started by Brosnihan in Providence has spread and also inspired other cities, such as Orlando, Florida, to create their own version of Good Night Lights. Are you aware of any other cities that have a similar tradition? 3. This simple yet powerful example of shining a light for others going through a dark time has grown far beyond Brosnihan's original expectations. "In my grander dreams, I hope other cities that have children's hospitals pick up the idea and run with it and create their own version of Good Night Lights," he says. "It could happen anywhere if someone is willing to give it a try with one light." Is there a children's hospital near you?